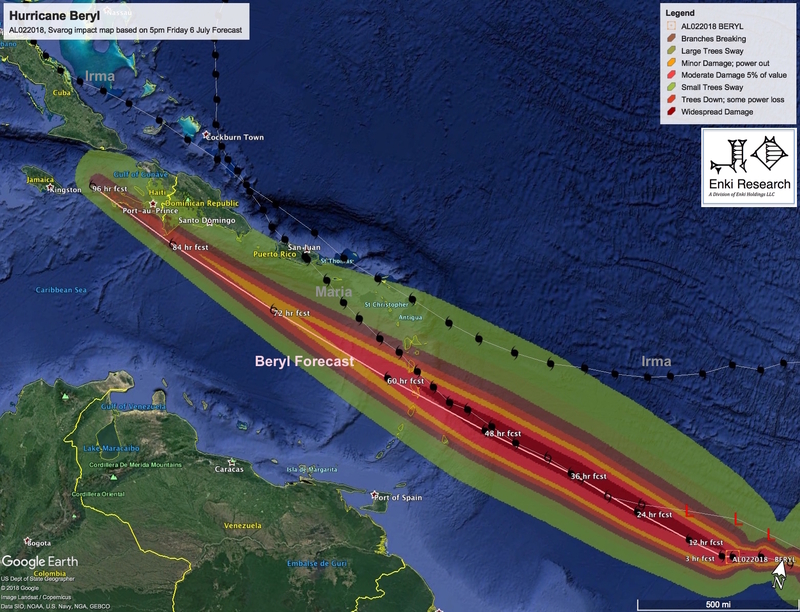 Hurricane Beryl has formed in the Atlantic, and is currently on track for the leeward islands. Given the extensive damage caused by Irma and Maria last year, this is a major concern as some areas are not anywhere near recovered yet (such as, much to the embarrassment of the US, Puerto Rico). Here is the current (5pm ET Friday Afternoon) forecast impact map. For reference the tracks of Irma and Maria are also shown. Beryl is a small storm, and is forecast to weaken considerably as it zooms past the windward islands. The main danger is wind damage on Martinique, and rain/flash flooding there and in other areas, although again many areas are still not in good shape from last year. If this forecast holds up economic impacts should be in the range mid hundreds of millions of dollars, mostly on Martinique. Haiti is also in the damage swath, but because of the poor infrastructure there, while economic impacts are generally small in value the humanitarian impacts could be disproportionate. Sadly this may also be true in PR and the southern Virgin Islands, which should see impacts starting late Sunday night in to Monday. If the storm follows the current NHC forecast track, the main danger will be rain/flash flooding as opposed to high winds. The forecast track and intensity of this storm are a lot less certain that would ordinarily be the case, so those in the region (and those who care about it) should pay attention this weekend.